F101 Tribe Members Descend on ProVela for the International F101 World Hampionships. This would be an Easter weekend like no other, the 30th March saw our F101 Tribe travel from the USA, France, Netherlands, Spain and the UK to gather at ProVela for the international F101 World Hampionships (yes that’s spelt right!). 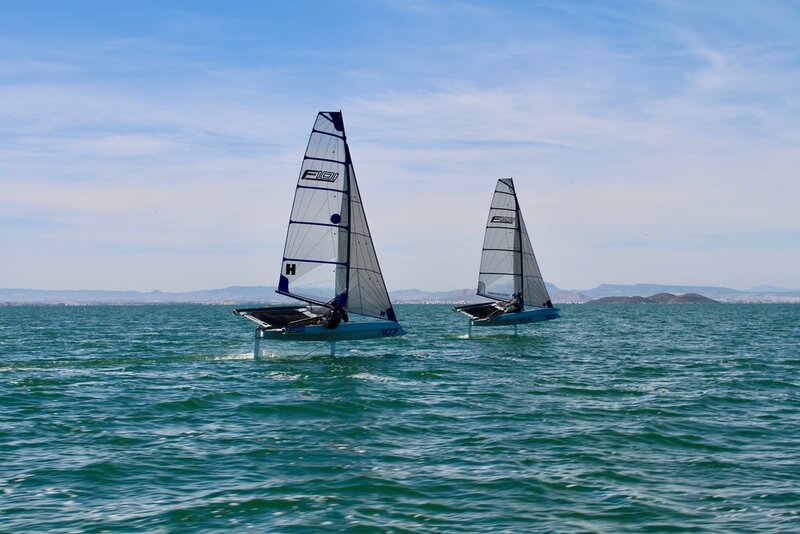 Six boats and nine Tribe competitors, as well as the design and build team from Foiling World, arrived to a stunning weather forecast, ready to contest the infamous F101 Ham prize over three days of intense coaching, competition and après-foiling socials. 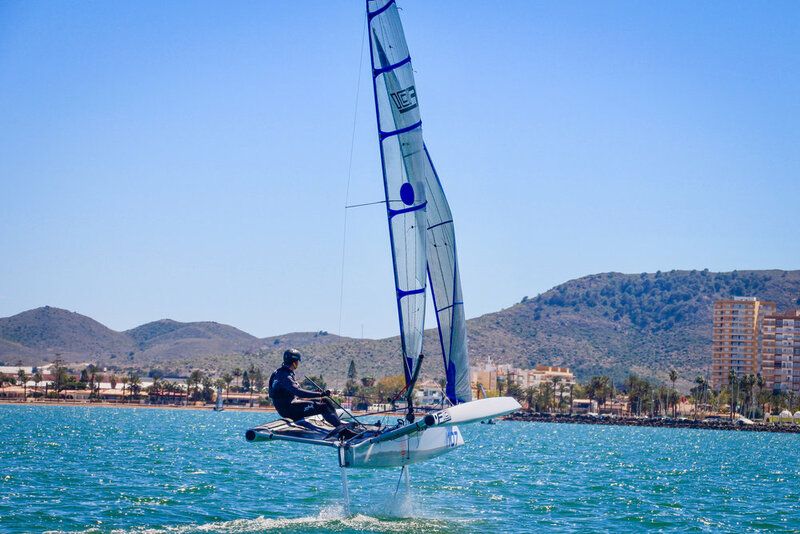 The Hampionships organisation team consisted of Chris Eades from ProVela, London 2012 Olympic Games Sailing Event Manager, Rob Andrews, Former Extreme 40 Race Director, Alan Hillman, and two-time SB20 World Champion, Jerry Hill. Ten races were held on Saturday 31st with Ron Price winning his first ever F101 race, congratulations Ron! Other race winners included John Iglehart, Alan Hillman, Martijn Buitenhuis and Simon Perry with Simon holding on to a small lead. The following day numerous race winners were counted, however after looking at the daily scores over six foiling races it was Martijn Buitenhuis who had a small points lead over Simon Perry. That’s a close competition guys! Here’s a summary of how the Hampionship days unfolded. This day was all about the briefing, rigging and preparation for what would be the long distance coastal race of the event. 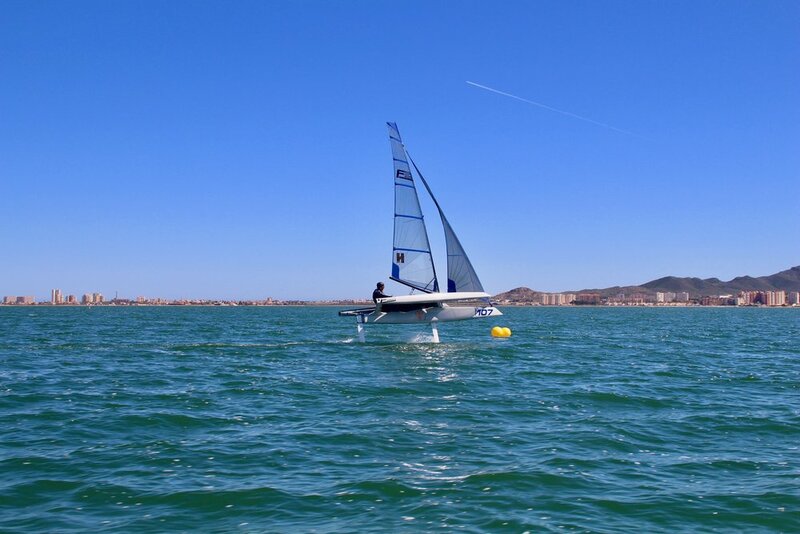 The Tribe set off in a fickle 4-6 knots on what was initially a fetch from Los Alcazares to the new home of ProVela’s foiling club in Mar De Cristal, eight miles along the coast of the Mar Menor. These light winds were not to stay for long with the breeze swiftly turning to the south resulting in an increase to 20 knots. This proved a kind gift from the gods to competitors that had hugged the Mar Menors west coast, seeing gains over the boats that jetted off early to pass close to the Isla de Perdiguera who were left with an upwind finish just to the West of Baron Island. The first Tribe member to make it home was John Iglehart who enjoyed some refreshing breeze off the Mar De Cristal marina as he waited for the rest of the fleet to make it home. 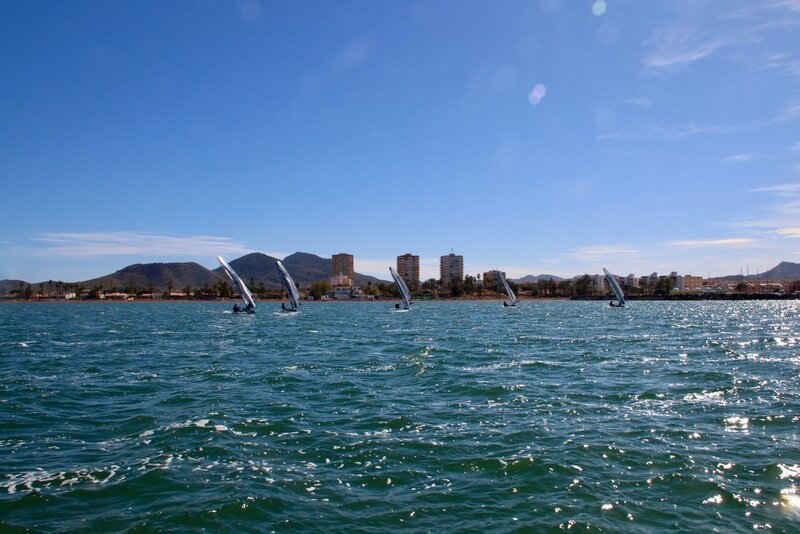 The breeze made for epic foiling conditions resulting in the entire fleet playing around outside the marina before finally coming ashore to be greeted by ProVela staff armed with cold beers, ready to enjoy the warm, sunny evening. Based on a forecast of light winds the Tribe called for a lay morning. Whilst the sea breeze built, many Tribe members spent the early hours of the day mountain biking and visiting the historic city of Cartagena to see the roman amphitheatre, whilst others simply worshipped the sun. As the day progressed Foiling World held a short briefing and then proceeded to go through useful learning tips such as best practices, boat set-ups, turning and boat handling. The rules for the day were then decided upon in order to align with the current foiling skills of the Tribe. From here it was all hands on deck and racing began! The Tribe faced reaching starts, fast foiling reaches and foiling (ish) gybes at the turning mark before a screaming reach home to the finish line. As fatigue set in crews rotated, deciding to maximise the opportunity for personalised coaching. After ten races the Tribe called racing for the day to an end just in time for a late dinner at the nearby picturesque Spanish fishing village of Cabo De Palos. 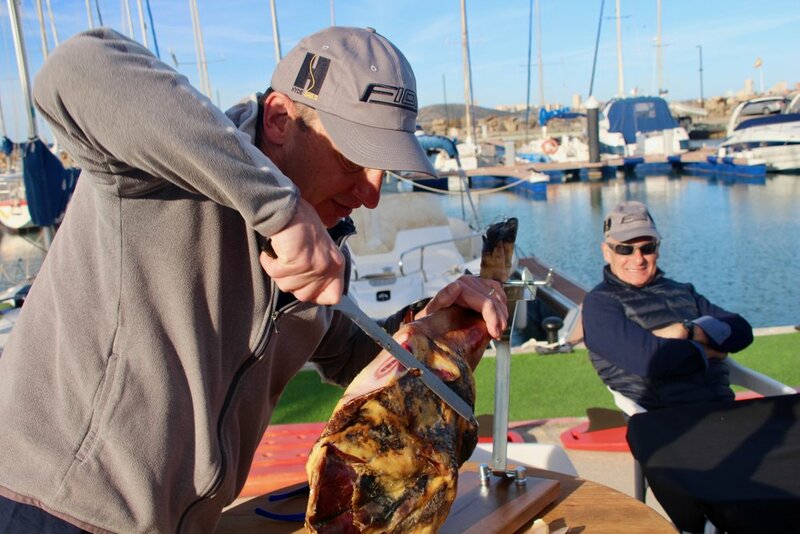 As the sunset and the muscles ached, everyone enjoyed an evening of fun with friends and family before the foiling action started again the next day. The following day’s programme was again decided by the Tribe and based on a building sea breeze for the afternoon. With further mischief available in Cartagena some of the senior Tribe members were seen leading the fleet astray, which may explain why some were deemed to be “mission in action” before day three. By the morning of day three most competitors had recovered sufficiently from the previous evenings’ shenanigans before the start of the 14:00 coaching seminar where lessons focussed on downwind foiling techniques. This would be needed as the race management team had set the Tribe some reaching starts to a wing mark followed by a dead downwind leg which would have to be negotiated by foiling deep and gybing, before rounding up the full-on hike-athlon on a close reach back to the finish line. After an afternoon of flying around in 8-10 knots in perfect sunshine the exhausted fleet were shepherded back to the marina for de-briefing and prize giving. All competitors were scored by a combination of peer group perception and race results over the three days of competition. Interestingly Martijn thought Simon had won and Simon thought Martijn had won, which goes to show how close the racing was! The prize giving then took a moment to thank the event sponsors ProVela, Foiling World Hyde Sails, Harken and Gul for all their support. Would you like to become a member of the Tribe and learn to foil? To become a Tribe member you first need to own an F101. Once a part of our Tribe you will be involve in all the behind-the-scenes action where we chat through fastest times, things we’re learning, events and more. We are offering tailored courses with fully trained instructors. Click here to find out more.